You need a replacement scalper deck that can withstand the demands of screening prior to primary crushing. Samscreen’s Grizzly scalper deck is built for maximum impact and abrasion resistance, and can be manufactured to your specifications within one week of receipt of order, so you’ll get what you need quickly. 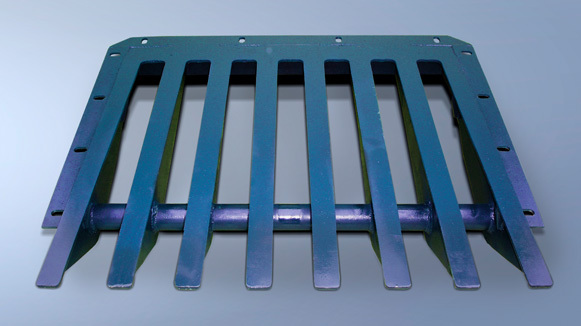 When you need a replacement scalper deck that can withstand the demands of screening prior to primary crushing, you can count on Samscreen’s replacement Grizzly scalper deck. Our Grizzly scalper deck features tapered Maxwear™ 400 bars for maximum impact and abrasion resistance. Samscreen will manufacture our replacement Grizzly scalper deck to your specifications within one week of receipt of order, so you’ll get what you need fast with minimal downtime. Samscreen will custom design your Grizzly scalper deck to your exact specifications. And our replacement Grizzly scalper deck us designed with the toughest applications in mind, such as rip-rap and land clearing, with Maxwear™ 400 wear surfaces – this heavy-duty Grizzly scalper deck is built for impact and sliding abrasion. It also offers the benefit of being self-cleaning, since it can be manufactured with any size tapered openings. And, the stepped decks promote material stratification and are abrasion-resistant, so they’ll last, even when used for your toughest applications. Samscreen’s Grizzly scalper deck is also easy to install and remove, which helps keep your operation running smoothly. Our replacement Grizzly scalper deck is manufactured with your needs in mind. Downtime is costly, which is why we work hard to make sure you receive your replacement Grizzly scalper deck quickly. We never compromise on quality, because it’s important to us that our customers are able to get back to work in the shortest time possible. We can manufacture your replacement Grizzly scalper deck to spec within one week of receiving your order. Simply call us at (888) 344-3653 and we will be happy to assist you with your replacement Grizzly scalper deck needs.